Three days ago, after months upon months of rumors and reports, Apple sent out official invites for the media event where they will be announcing the next-gen iPhone. The event is set to kick off at 10:00 AM in San Francisco at the Yerba Buena Center for the Arts which, according to the photos we’ve across online, is being prepared for the mega unveiling. Check them out after the jump. 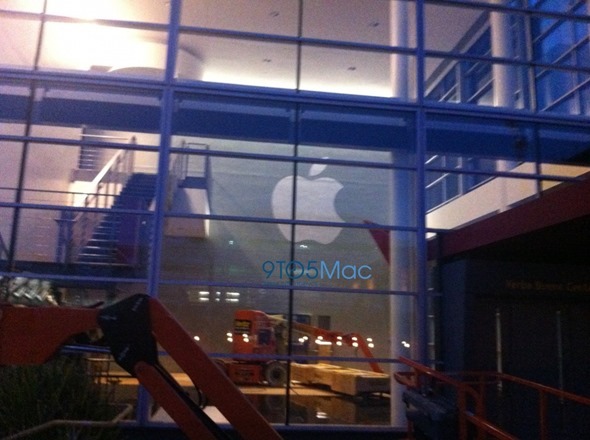 Because the event is still five days away, decorations so far are pretty minimal – featuring only a large Apple logo. We expect to see a much more lively Yerba Buena on the day of the announcement. 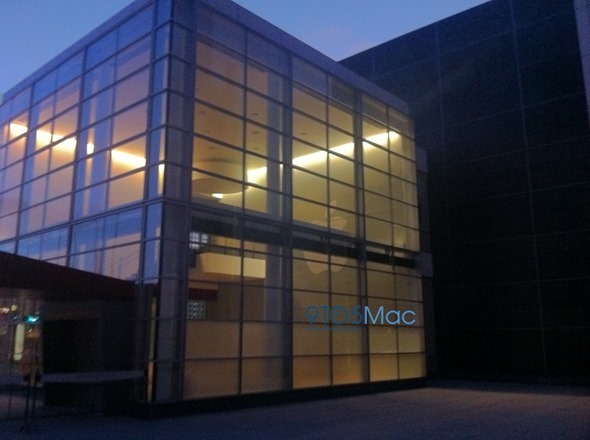 This is the first time Apple is holding an iPhone announcement event at the Yerba Buena, which is usually reserved for iPod and iPad-related announcements. We’ve seen a good number of leaks so far, with front / back panels, dock connectors, headphone jacks and the culmination of them all in the form of a fully assembled iPhone 5 body. Based on these leaks, rumors and reports, the new iPhone is expected to have a larger, 4-inch widescreen display, an evolutionary design update in the form of a slimmer body and a new metal + glass back, a smaller dock connector, exclusive use of Nano-SIM, full support for 4G LTE, and an appropriately larger battery. These features aren’t too exciting for us, but we have a feeling that Apple will find ways to wow their audience. A camera that can take on high end point and shoots? A graphics chip that offers PS Vita level of graphics? More aggressive pricing? Lasers? Who knows! 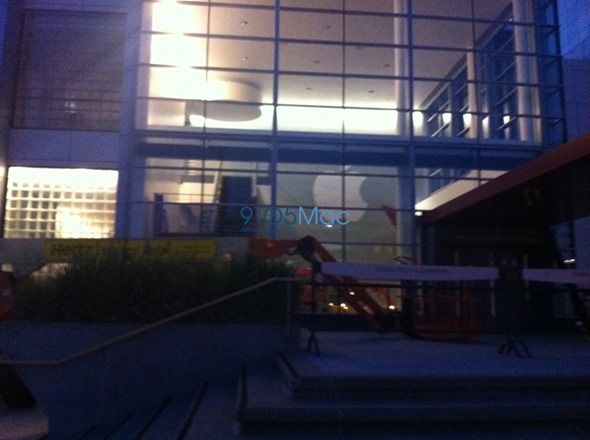 Also, after seeing the shadowy 5 in the invite image, we strongly expected the next iPhone to be called iPhone 5 instead of “new iPhone” as previously claimed. Sure, it’s actually going to be the sixth generation iPhone, but after 3G, 3GS, 4 and 4S, 5 sounds like a logical step and makes sense for less “techie” customers. We will cover the event in its entirety when it kicks off at 10:00AM PDT on September 12th, so stay tuned! We may see more leaks as we come closer and closer to the event’s date.